While not quite "the finest course in the country as its web site suggests, Royal Gems is a solid layout designed by Gary Roger Baird. 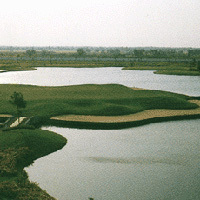 The course is a mixture of American, Scottish and Local features, making for a pleasant 18 holes at one of Bangkok's lesser known courses. With a good combination of short, long, easy, difficult and exciting holes, the only reason it's not more popuar is its location. Excellent choice for golfers staying at hotels close to the Chao Phraya River. It has some interesting holes and is not very well known amongst tourists. This would be an excellent golf weekend as there is a golf lodge, driving range and a host of other facilities to keep non-golfers busy. The small restaurant has some great food.